A Letter from Blue Sky and Sea - Izu Shimoda Photo Diary: Sakura, Sakura and Sakura !! I could get 2 kinds of Sakura at last, and this is one of them called "Shirahama Sakura". 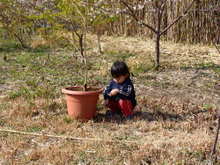 This Sakura tree is his original, which has white flowers and blooms at the end of January. 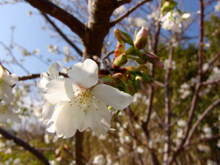 Yes, it blooms earlier than Kawazu Sakura which blooms in Februray and March. We will be able to see 5 kinds of Sakura blossoms next year.